Trivantage carries an extensive selection of beautiful upholstery fabrics, cover fabrics and more from top brands like Sunbrella®, Phifertex®, Nassimi, and Triton®, available by the yard. But that’s not all – grab all the supplies you need, including trusted tools, unique embellishments, cleaners, adhesives, and protectants, all in one place. With the right supplies, you’ll get the job done quickly and efficiently. 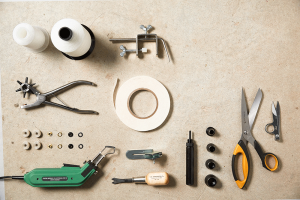 Browse tools like hammers, hole cutters, staple removers, zipper jigs, grommets, and scissors as well as finishing supplies like thread, webbing, tape, and rope, so you can stock up before your next project. Add the finishing touch to upholstery with hand-picked trim, cord, and braid. With products like Sunbrella® Fringe, Twist, and Welt Cord, you’ll find the perfect details to complement your customer’s style. Maintaining upholstery is key to prolonging the life of the fabric. Trivantage stocks the most reliable cleaners, protectants, and adhesives. To find all the supplies you need for your next upholstery project, please visit trivantage.com, or contact your Trivantage customer service representative.